← Is the debate on sending soap to Africa missing the point? Sustainability of rural water services: what next for WaterAid in Mali? There are action points under three headings: in supporting the actual delivery of rural water services with municipalities or local NGOs; in developing action research to address some of the gaps in knowledge identified; and in terms of advocacy at national level. The key challenge discussed which runs through all these levels is how the ongoing costs of rural water services are shared between users, local government and national government. In Mali, official policy is that rural water users should pay for all the costs of drinking water provision for 20 years after the installation of an infrastructure. After this, it is assumed that the facility needs replacing and national government will step in and pay for this. In practice, users are often able and willing to pay for minor maintenance and small repairs – but not the costs of major breakdowns, which can rarely be avoided for 20 years. Since the law under decentralisation says that each local government is ultimately responsible for rural water services in their municipality, many people interpret this as including responsibility for paying for major repairs and rehabilitations which are beyond the capacities of the users. However, since municipalities are underfunded themselves, they may not have the means either and so NGOs tend to step in. The problem is compounded by the lack of accurate data on what the true costs are of running rural water services over time, meaning that splitting the costs involves a strong element of guesswork anyway. These problems are not unique to Mali – the WASHCost project led by IRC is perhaps the best example of a large-scale project trying to address these issues. Outputs emerging include better proposed definitions of the different costs involved in delivering rural water services (rather than vague ideas of ‘small’ or ‘big’ repairs), and initial estimates of what these costs are in the countries involved in the project. 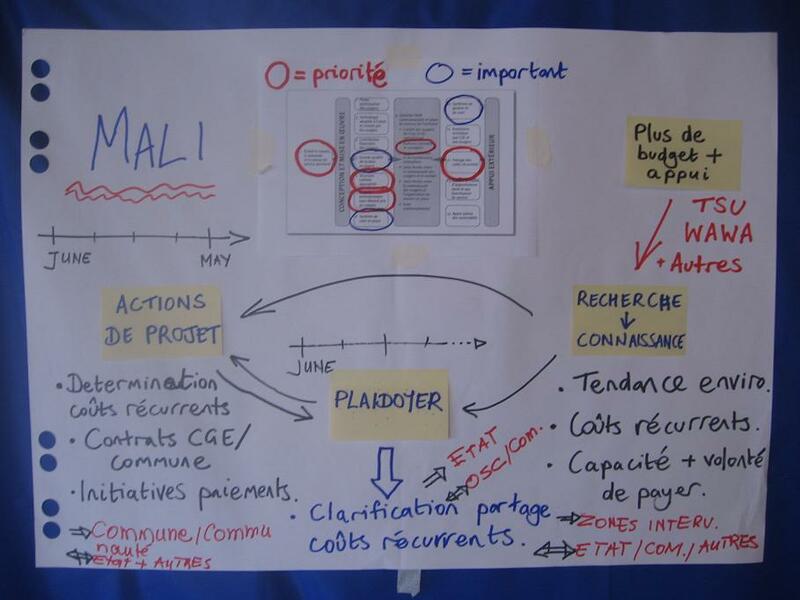 Some of WaterAid’s work in Mali will take some of these ideas forward and adapt them to the Mali context. For example, one of WaterAid’s municipality partners has been closely tracking all the costs contributed by users and by the municipality in their area for the last few years. The municipality’s technical unit is now working with WaterAid to analyse this information and share the approach with other partners of WaterAid in Mali, who can perform similar research to understand the costs in their regions. This research from local levels can then hopefully later form part of the evidence for advocacy at national level to clarify Mali’s official overall policies on cost-sharing. Update – I had written this and was ready to post when I saw an excellent blogpost from Patrick Moriarty (working with IRC in Ghana) highlighting the additional problem of whether or not local government staff have money – apart from their salaries – for the wider costs involved in supporting ongoing services beyond just the costs of maintenance and replacement parts. These ‘direct support costs’ – such as vehicles and fuel – are what is needed for the sorts of follow-up visits and monitoring that the local technical units supported by WaterAid do in Mali, but in many places this money is lacking.